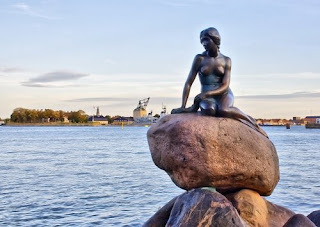 The Little Mermaid (Den Lille Havfrue) is a fairytale by Hans Christian Andersen. The original tale of the Little Mermaid is rather different to Disney's adaptation. Rather than becoming human to get the prince to love her, the Little Mermaid desires a human soul. This is because mermaids live for 300 years but turn into sea foam when they die. Humans live for a much shorter time, but they get to go to heaven when they die. The story differs vastly from Disney's and is really quite dark. Instead of giving up her voice, the Sea Witch cuts out the Little Mermaid's tongue. And when she gets her human legs it is extremely painful for her to walk on them. She does have to get true loves kiss, but this is because it's the only way to obtain a human soul. However, the prince is already in love with a temple girl and they get married. The Little Mermaid is heartbroken and turns to her sisters who tell her that to become a mermaid once again she must stab the prince and let his blood drip onto her feet. Her sisters had exchanged their hair for a knife from the Witch. 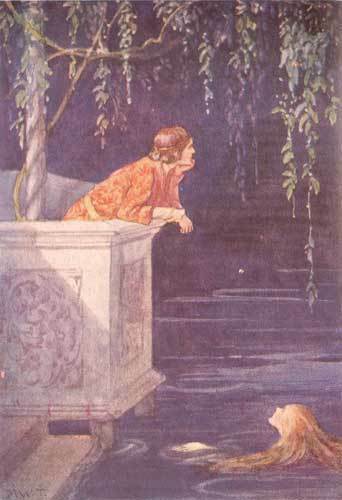 The Little Mermaid cannot bring herself to murder the prince, and instead throws herself overboard and turns into foam. But suddenly she feels herself being lifted and discovers she has become a 'daughter of the air'. She is told that she has been rewarded for her efforts and that if she does good deeds she will eventually gain access to heaven. The Little Mermaid has her own statue in the sea in Copenhagen. I'd love so much to visit her one day. Have a beautiful Monday and a wonderful week ahead, everyone! I only knew the Anderson version growing up. When Disney announced their version, I couldn't believe they were doing something so depressing! Oh yeah, they changed a lot! New follower here. I'm stopping by from the "A to Z" challenge and I look forward to visiting again. Geez and these are kids' stories?! I haven't heard that version. I'm going to give it a shot now =). I've seen the statue, but never knew the actual sad story of the little mermaid. 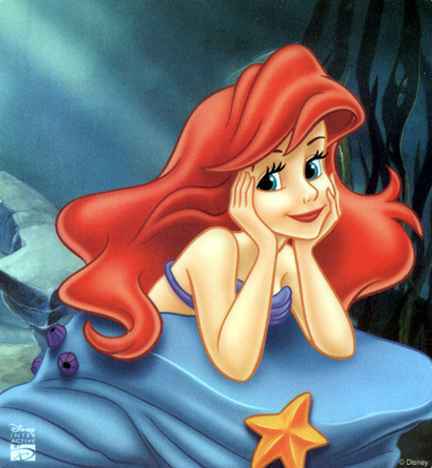 My favorite Mermaid story is Disney's Little Mermaid. I guess it is a little dark when you write it out. LOL I guess I'm getting immune!?! I am your newest follower :) I think I followed you before as Jacy (from My Name is Jacy blog) but am now starting anew, as Clementine!